Screenwriters: Ol Parker, Richard Curtis and Catherine Johnson, based on Johnson’s original musical. Previewed at: Entertainment Quarter, Moore Park, Sydney, on 17 July 2018. Mamma Mia! Here We Go Again, directed by Ol Parker, the writer of the two Best Exotic Marigold Hotel films, is bound to be a hit at the box office, just like its predecessor, but it shouldn’t be because it’s really a pretty lame construction. 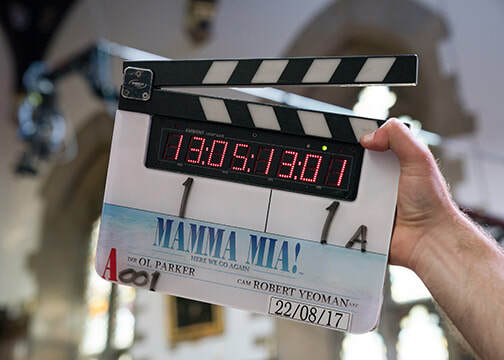 “Here we go again” is certainly right because the plot leans heavily on the earlier 2008 film, Mamma Mia! The Movie. As with many sequel/prequels, it is not as vibrant as its predecessor, although not for lack of trying, and the script is enveloped in a thick layer of sentimentality that makes for some cringe-worthy viewing. However, die-hard fans of the original have waited a decade to find out what happened to Donna and her cohort and they probably won’t be disappointed. Mamma Mia! Here We Go Again is beautifully captured by Robert D. Yeoman’s fine cinematography, especially the stunning location setting. Another plus is Michele Clapton’s weird and wonderfully colourful costumes, which add to the sense of visual effervescence. The ABBA numbers are fun and there are brief cameos from both Benny Andersson and Björn Ulvaeus, who added two new numbers to supplement their classic songs and Anne Dudley’s score. Unfortunately, some of the numbers are delivered in a less than stellar way, as not all the cast can sing – especially Brosnan and Cooper. Cher’s performance, however, makes up for these lesser moments as she belts out a couple of tunes and even performs Fernando in a duet with Andy Garcia. The constant flow back and forth as the story evolves requires some concentration but does explain the lay of the land, so to speak – if it interests you to begin with. Overall though, this is an odd film. It’s as though the producers and Parker deliberately decided to keep a rough-around-the-edges, ‘let’s put on a show’, kind of feel to it. Haven’t they heard of dubbing? Still, while it may not be everyone’s cup of tea, Mamma Mia! Here We Go Again is entertaining enough and certainly makes you think about visiting a Mediterranean Island. Stay for the end credits, as one of the funniest scenes screens after they’re over. It involves the island’s Customs Officer, played by the British/Iranian comedian Omid Djalili. The few remaining audience members guffawed after that one!